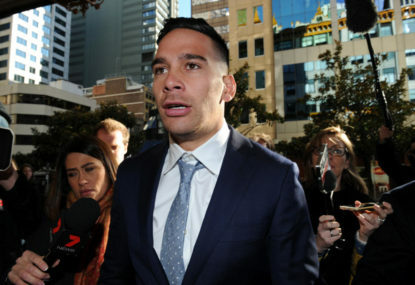 Parramatta playmaker Corey Norman has copped an eight-week suspension from the NRL, as well as a $20,000 fine for his various indiscretions over the past few months. – Distribution of said videos. It’s quite a rap sheet Norman has built up for himself over the past weeks, and the NRL has investigated and decided to act. The move has been backed by Parramatta. Nick Weeks, the NRL’s head of integrity, said Norman’s antics were a signal for players: No more. “The message is clear… players cannot put themselves in a position where they may damage their own reputations and that of the game,” Mr Weeks said. “We have been consistent this year in imposing strong penalties where players bring the game into disrepute through actions off the field. “Whether it is drug possession, criminal associations or social media use, players understand the consequences that can flow from illegal or other unacceptable conduct. Weeks is referring to Norman, and more recently a Brisbane Broncos player allegedly being held to ransom, with a recipient of a video that shows potentially unsavoury or illegal activity being shopped around to the media. With Parramatta effectively out of the finals race due to the 12-point penalty they were slapped with for cheating the salary cap, Norman will miss the rest of the season. The question of the fairness of the punishment will inevitably be asked, but considering the four offences being alleged, it seems like eight weeks, and the rest of the season is a reasonable result. What do you reckon Roarers? Is this the punishment you would have handed down to Norman?